Note: Black Box Casino is to be published September 30 by Praeger. In writing this account of the financial crisis, the author found that ultimately some of what he had written had to be cut from the book. Below is an excerpt that was written too late to make it into Chapter 7: "Fast Money and High Stakes." The Evanston, Illinois hedge fund Magnetar Capital LLC stated in April 2010 that it engaged in trading activities that its senior management claimed were neutral towards the housing market. That is, Magnetar claimed that they were making simultaneous shorts and longs on various pieces of collateralized debt obligations, which were backed by mostly subprime mortgage-backed securities. The point being made with the claim of neutrality was they were not betting against the housing market and bad subprime loans and securities. After a number of news stories surfaced in 2010 about the $50 billion or more in losses from CDOs deals in which Magnetar took positions, the claim of neutrality became a public defense against any potential claims Magnetar had influenced the selection of collateral in CDO deals in a way that would provide the hedge fund with performance bet opportunities; that is, CDO tranches against which it could place high stakes bets and reap rewards when they failed. Slowly information is emerging, however, that on many deals, the claim of neutrality does not withstand close scrutiny. On June 21, 2011, JPMorgan Chase settled with the Securities and Exchange Commission over charges it had committed fraud by putting together a deal -- CDO Squared in 2007 -- that lead to enormous losses for investors -- a deal that also boomeranged on the firm. Magnetar executed a correlation trade with CDO Squared as it had with other of its investments, such as the notorious Norma CDO from Merrill Lynch. Squared was a CDO made up of other CDOs. The SEC settlement with JPMorgan Chase just also happened to reveal that in that deal Magnetar’s long position on the equity tranche was $8.9 million and its short position on mezzanine tranches was $604 million. There's hardly any way of looking at positions Magnetar took on the Squared CDO and not conclude it was a $604 million bet against subprime mortgages. The question is whether or not Magnetar played a role in selecting the assets in the deal in way that would assure it reaped a bonanza. The SEC obtained a series of communications that showed Magnetar played a role in selecting 33 of the 65 CDOs in Squared – all the ones the hedge fund bet against. The Squared CDO defaulted in January 2008, eight months after it closed in May 2007, costing J. P. Morgan $880 million in losses from the super senior tranches it held in the deal, according to the SEC. When the deal was arranged J. P. Morgan earned $18.6 million on the deal. The investors who bought the mezzanine tranches of Squared knew nothing of Magnetar’s role. The U.S. investors included Thrivent Financial for Lutherans in Minneapolis and Security Benefit Corporation in Topeka, Kansas. In East Asia, investors in Squared included Tokyo Star Bank, Far Glory Life Insurance Company Ltd., Taiwan Life Insurance Company Ltd., and East Asia Asset Management Ltd. The deal was a tough sale for J. P. Morgan’s world wide sales staff. The employee in charge of global distribution for the tranches in the deal wrote to the sales team on March 22, 2007, that “we are soooo pregnant with this deal, we need a wheel-barrel (sic) to move around….Let’s schedule the cesarian (sic), please!” The sales team failed to disclose that Magnetar played a role in asset selection and was betting against the deal. Steffelin was charged with securities fraud by the SEC on June 21, 2011, for failing to disclose Magnetar’s role. Steffelin’s lawyer Alex Lipman claimed it was a “real reach” for the SEC to charge Steffelin when it was J. P. Morgan that failed to disclose Magnetar’s involvement in the deal to the investors. Even so, while the deal was being put together, Steffelin sought employment with Magnetar, further cementing the appearance of collaboration in selecting assets for Squared. Key players in the Squared fiasco escaped any fines or punishment. Michael Llodra, who headed the asset-backed CDO team at J.P. Morgan at the time of the deal, was not charged by the SEC. Neither were any high level executives at J. P. Morgan. J.P. Morgan, without admitting or denying any wrongdoing, paid $153.6 million to settle charges it had misled investors. Cue the Bee Gees who sang the mega hit "Massachusetts" back in 1970s. Having missed out on the nomination to be the head of the Consumer Finance Protection Bureau -- an agency that was her brainchild -- Warren will be packing up and going back to her home state. She declined to say if she was planning to run for the Senate and lauded the new agency. She dodged a question about JP Morgan Chase's Chairman and CEO Jamie Dimon's criticism of heavy regulation coming from the Dodd-Frank Act, which Dimon said last month was impeding the progress of the recovery. Although Warren was believed to be the Obama Administration's favorite to head the agency, she was hugely unpopular in Congress and faced fierce opposition. This is the second hip-hop music video by John Papola and Russ Roberts at http://EconStories.tv. In this one, Hayek knocks down Keynes after several rounds of debates interspersed with simulated boxing, but the chairman of the Congressional panel hearing the debate -- who suddenly transforms into the fight referee -- declares Keynes the winner. 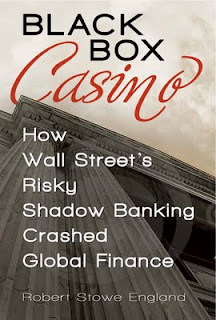 Robert Stowe England's new book on the financial crisis -- Black Box Casino -- will be published in September by Praeger, an ABC-CLIO imprint. The publication date has been moved up two months from the prior release date of November 30. A press statement announcing the future debut of the book was released today by NA Associates, a New York public relations company. See statement at the end of the story. NA Communications also released the reviews that will appear on the dust jacket of the book, which also follow below. To request a review copy, write to Mr. England at rengland@us.net. "Mr. England writes about the financial crisis with harrowing precision." "First Reckless Endangerment and now it is Black Box Casino's turn to shine a bright light on the root causes of the mortgage meltdown. England, relying on decades of experience as a financial reporter and consummate research skills, documents how government housing policy, political expediency, and crony capitalism combined to cause the mortgage meltdown that nearly sank the world’s economy." "Drawing upon sources not available to previous writers, England presents the most complete account yet of how the collapse of an obscure subprime mortgage lender in January 2007 could eventually take down some of the greatest names on Wall Street by September 2008, wreaking massive economic destruction that Americans are still struggling with today." THE AMERICAN PEOPLE WANT TO KNOW WHAT WENT WRONG IN THE FINANCIAL MELTDOWN OF 2008. NOW COMING SOON, BLACK BOX CASINO, THE BRILLIANT NEW BOOK HAS THE ANSWERS. New York, New York, July 7, 2011: BLACK BOX CASINO: How Wall Street’s Risky Shadow Banking Crashed Global Finance by Robert Stowe England solves the puzzle of what led to the biggest financial crisis of modern times – and exposes the follies in Washington and on Wall Street that caused it. To be published in September by Praeger, the book is already receiving raves from financial executives, regulators, politicians, Wall Street insiders, fraud litigators, risk analysts, media and many more. 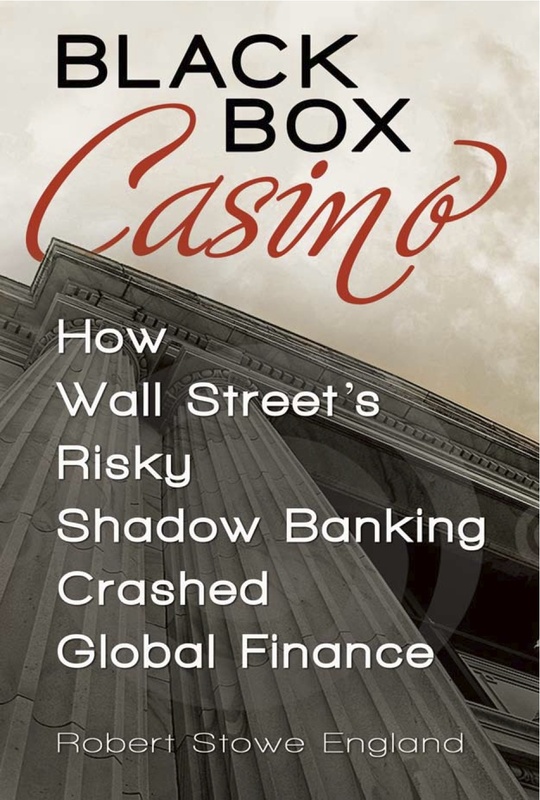 BLACK BOX CASINO describes how Washington created incentives that drove half of all lending activity into the shadow banking system, where risks can be hidden in black boxes and markets manipulated for huge private gains at public expense. The book also tells how Washington generated a race to the bottom in mortgage lending standards, loading toxic assets on the books of financial institutions. Mr. England is a veteran financial journalist and author who has covered the mortgage industry inside and out for over two decades as senior writer for Mortgage Banking magazine. He witnessed from a front row seat the reckless behavior that wrecked the global economy. In this breakthrough exposé the author sorts through a mountain of evidence, interviews and information to give the American people and the world a compelling, fast-paced account of what went wrong, why, and who’s to blame. BLACK BOX CASINO is the book the world has been waiting for. John Papola and Russ Roberts have produced an entertaining and educational rap debate video between British economist John Maynard Keynes and Austrian economist F. A. Hayek. A modern reincarnation of the two economic theorists argue the importance of stimulating demand to lift an economy out of a bust (Keynes) versus saving and investing in free markets and skepticism about booms (Hayek). The video is from econstories.tv. Subprime Scandal: Democrats thought they'd dammed up the truth about government's role in the financial crisis. But the levies are breaking, thanks to a spate of rogue new books on the subject. The latest, "Reckless Endangerment," shreds the narrative carefully constructed by Democrats and the liberal media that Fannie Mae and Freddie Mac were only bit players in the crisis and followed Wall Street into subprime lending. It details how the federally chartered mortgage giants in fact led the way in relaxing underwriting standards for the entire industry — thanks to relentless pressure from Democrats, who used them as off-budget piggy banks to fund their social crusade to boost minority homeownership (and shore up their voting base).